Returns a mimimum rotated rectangle enclosing a geometry. Note that more than one minimum rotated rectangle may exist. May return a Point or LineString in the case of degenerate inputs. 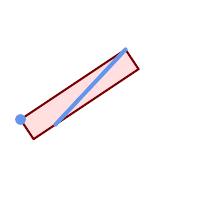 Oriented envelope of a point and linestring.